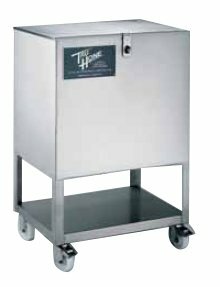 The KCS1824SL Single Lid Knife Cart Sanitizer is designed to sanitize and safely and securely store 128 knives. 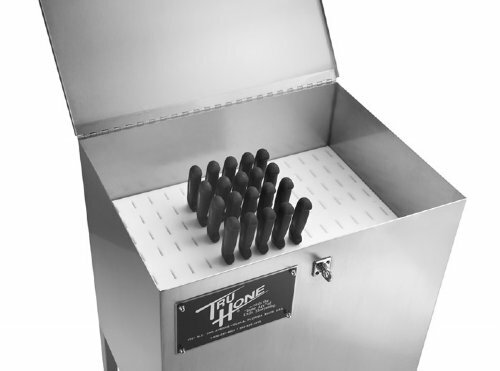 Knives are sanitized by filling the knife cart with a mixture of sanitizing solution and water and soaking the knives for a period of time. Sanitizing solution is drained through a ball valve at the bottom of the Knife cart. Knife slots (1 1/4" - 3.18cm) cut into its 1" polypropylene board allow for the safe removal and return of knives after sharpening. Four stainless steel casters (front casters have locks) make it easy to transport knives to and from the cutting floor. A piano hinged lockable lid helps to secure knives in the cart and gives you complete control of your knife inventory. Constructed using heavy 13 gauge/304 stainless steel, the KCS1824SL is built for years of service. Dimensions: width 25"(64cm) x depth 19"(48cm) x height 36"(91cm).